From this past October to last week, students have been working with WHSAD teachers and community mentors in developing innovative products. 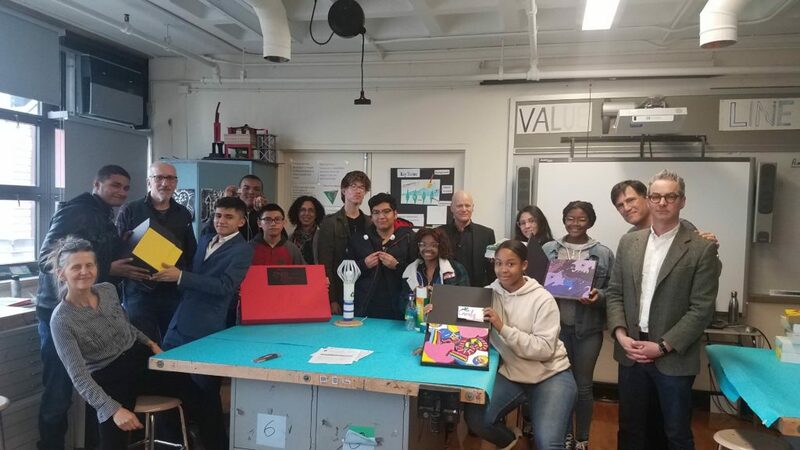 Throughout the course of the Incubator project, students have learned how to plan, pitch, and execute on their ideas, and how to modify their work based on feedback from teachers and mentors. Due to the efforts of teachers Ms. Pia Moos and Mr. Ira Geringer, and mentors Sinclair Smith, Director of Groundfloor Incubator at School of Visual Arts; Noel Wiggins, co-founder of design and manufacturing company, Aeraware; and Bill Harvey, a sculptor and housewares designer, musician, supporter of WHSAD for many years; WHSAD students gained essential insight into the design process. The following are narratives from some of the students who participated in the Incubator project. 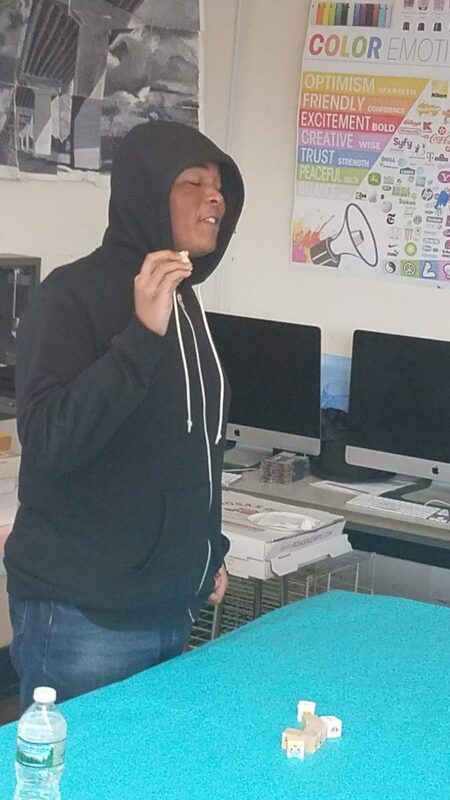 Every Tuesday, my fellow peers and I attended a program called Incubator. This after school program allowed us to become entrepreneurs and designers of a project. This program started in mid November and ended in the beginning of April. From the beginning, we had mentors from KickStarter consistently come every week and teach us about creating a project that would benefit society today. We started by understanding the meaning of value propositions, labeling, lettering, calligraphy, Photoshop, Adobe, and other programs to make our project stronger. To further our ideas, the mentors even took us to their KickStarter office and Moma museum to develop more ideas and get inspiration for our projects. In the beginning, every student had to design a new puzzle that would get the attention of everyone, not just children. But a couple weeks later, Sinclair Smith allowed us to expand our ideas and create anything that we wanted to keeping the same mindset of benefiting the people. Chandler Mclaurin presents her project. The questions I got after attending this adventurous program were would you do it again? How did you like the program? How was the process? Did you like the mentors? Do you learn a lot from these people? And, most importantly, what did you gain out of this? The answers to all these questions is life is about gaining experiences and taking a chance. At first, I was hesitant about going to this program, but after spending months creating a project, I can finally call mine is an amazing feeling. Working hard every Tuesday, creating something for people to use, and gaining the skills of becoming a create presenter is amazing. The only thing for me was time wasn’t on my side, and I was a bit behind because I was taking my time not realizing how much work I had to get done in so little time. In all honesty, I recommend Incubator to everybody for the experience, and you can end up like me, having a project you call your own. 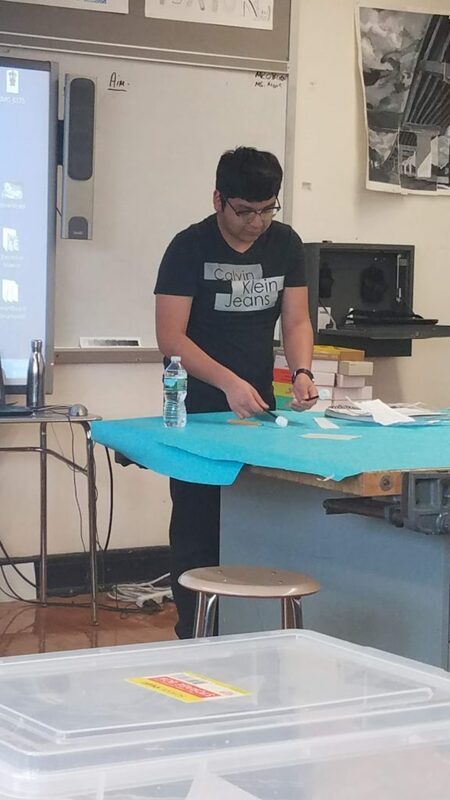 Francisco Sandoval prepares his project for display. As an entrepreneur or an industrial designer, one doesn’t exactly know where to begin brainstorming their ideas, and coming up with a final model is also usually very hard. The SVA Incubator, however, helped a small group of high school students do just that. Following a pre-summer meeting with the professionals who would be mentoring us, the Incubator seemed intriguing, and many liked the hands-on experience it would provide. Coming into junior year, I was willing to get involved into as many clubs as possible. After a short orientation, we were ready to commence our journey in the world of design. We kicked off by doing exercises that mainly helped shape our ideas and express anything that seemed interesting to us. After a while of doing so, however, many started to lose much interest in the club, due to its slow start. Still, some persisted, and we suddenly began a project to come up with a product that we would present and gain a perspective of how contemporary designers create profitable items. The beginning of the project started out confusing, with many people being indecisive on what their final product would be. Fortunately, though, we received great help from our mentors, and we also visited MoMa’s design store to get a good view of what many people came up with. Soon enough, many people started getting an idea on how to pragmatically develop a product: make it simple, useful, and affordable. Progress was starting to grow as more and more successful entrepreneurs, such as Jeff Staple, came to talk to us about business and how to manage time. Ideas were finally set up, models were being created, and we were getting ready to present. When we finally exhibited our ideas, many people were impressed, and what we had thought to have been flaws were, in fact, creatively incorporated so that people thought we had come up with the idea, which they liked. Overall, the SVA Incubator Club helped us as students grow and expand on our ideas to one day, possibly, make them a reality. The Incubator program in my opinion was indeed enjoyable as we were able to push our mindsets to a whole new level and also learn another way to make money. The Incubator process started off slowly, with each student getting to know each other in a formal manner along with the mentors. Once we all got to know each other, from what I can remember, we started learning about the basics of entrepreneurship and how people get their products out to the world. It was a fascinating learning experience. We learned about prices and how much materials would cost to make a product along with the general depiction of how well our products would do once they are out in the market. Then we learned about how to create our own products and what steps we would need to take/consider once our ideas are SET. Life in the Incubator program was really calm as we were so engaged in trying our best to come up with ideas for a product that others want (remember that, create something you know that people would WANT). 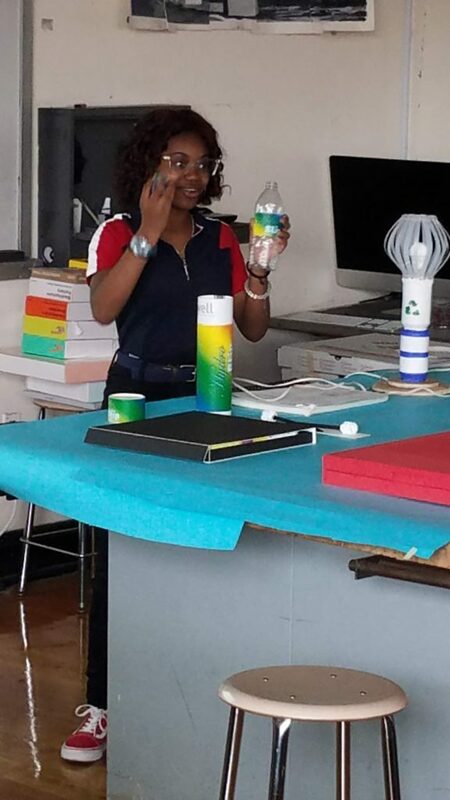 As we went along, we had to go at a limit in our imaginations since you have to keep in mind that you also need to find a way to bring that product to life. My brain was really active during all of this, to make sure that I was on point and supplying only the necessary details to my creation. I first got interested into the program when I received a letter of recommendation last summer that I was selected for the program. At first, I was really unsure about it since I had internal feelings from which firstly, I didn’t know what I was getting into and secondly, was this really something I was into? The truth is, however, it was worth the time and effort in being there. Even from all the time I’ve been in that program, it has allowed another idea of employment and employment skills for me to focus on whenever I feel like going down that route. Because of this program, I was able to create a product that wooed the crowd. I call it Emo Blocks. These wooden blocks are meant for humans around the world that can’t express their emotions verbally. The right term for this would be alexithymia, and it affects 7.5 million people worldwide (that’s 10% of the world’s population!). How it would work is from different sections of blocks that represent different moods, both positive and negative, and the user would simply pick one of those blocks up and face them towards their intended target. The associate would then be able to pin-point the exact emotion the user is trying to express and respond to them accordingly. It started off first as a tree that represented a negative and a positive emotion but mentors, such as Bill, wanted me to expand it, to shape it in different forms that best suit the idea the product is trying to get across, which worked perfectly. Doing a product like this was a really creative factor in my life. Never have I been able to produce something that could benefit others based on such a simple idea, which I admit, started off really small. From this I have learned to use my imagination more keenly. Imagination can lead to a lot of great things. It’s a powerful tool, stored in your arsenal, that brings about great change if used correctly. If any other student would like to join this program, I would like to tell you a thing or two. If you want to participate in a program like this, use your imagination wisely. Don’t take everything for granted because once you start the fire, you’ll only burn it brighter. Keep in mind that you have to make the product come to life. It’s not a bad thing for being imaginative, but you don’t want to get overwhelmed with ideas that will get you nowhere. Seriously, don’t as it’ll only set you back great distances than you’ve traveled already. Also, keep in mind that you want to create something that people will want. Don’t think about yourself, think about everyone else in the world and how they can use what you have created to benefit their communities. With all those tools in your arsenal, it’s the finishing touch that counts as much as the process. 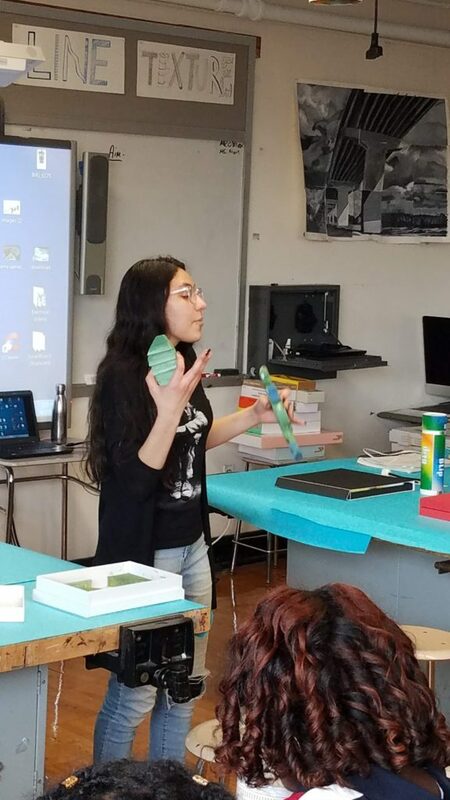 Jordan Gonzalez explains her work to her audience. 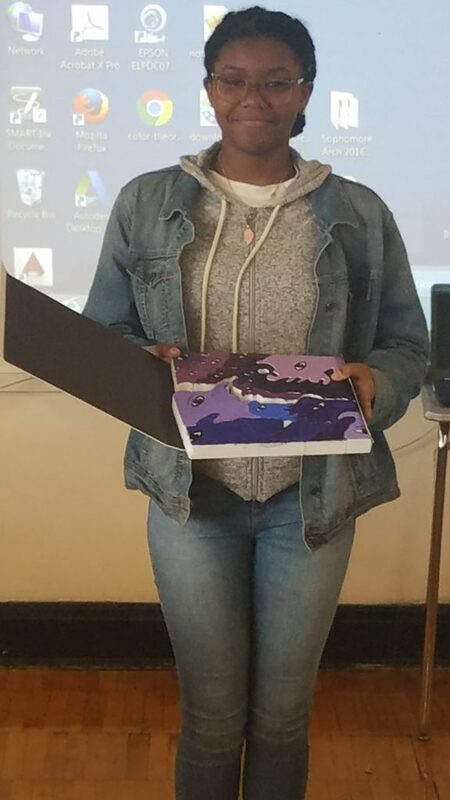 During our experience participating in the SVA(School of Visual Arts) Groundfloor Incubator program, I, Jordan Gonzalez along with D’Andra Gordon learned the steps it took to become an entrepreneur. We received help from the staff members of the program to make a product of our own from our ideas. The process was a bit difficult for both of us, starting with a design concept and making it come to life. We were involved with Incubator because we wanted to have the advantage of learning what it takes to become an entrepreneur every step of the way and what it takes to build up our own business. The mentors of this program helped us make our products and our ideas stronger and put ourselves in outsider’s shoes on why they need our product. It was a fascinating experience because it helped us think outside the box and know how to make our products different from others. The real-life experience is what pushed us the most, to know that we have people in the world with like minds gives us the inspiration to do better and give us the mentality of knowing that it’s possible. And we both thank the adults who were there for us and never gave up no matter how many roadblocks we hit. I would definitely recommend joining the Incubator group because it is very resourceful for the future. D’Andra Gordon proudly displays her final product.